I'm learning, as a new parent, that life doesn't stay the same for very long. There are so many "first" experiences to discover daily, and ever-changing seasons of life. Yesterday I boxed up Nicholas' newborn clothes. It's hard to believe that he ever fit into those tiny onesies, especially when I look at his beefy little 5-month-old body. Part of me misses the days of his newborn cry, how he would sleepily cuddle all day long, and the fact that he couldn't move very far! But I'm also really trying to embrace each season as it comes. Now that he's a bit older, it's obvious that he's a little boy. 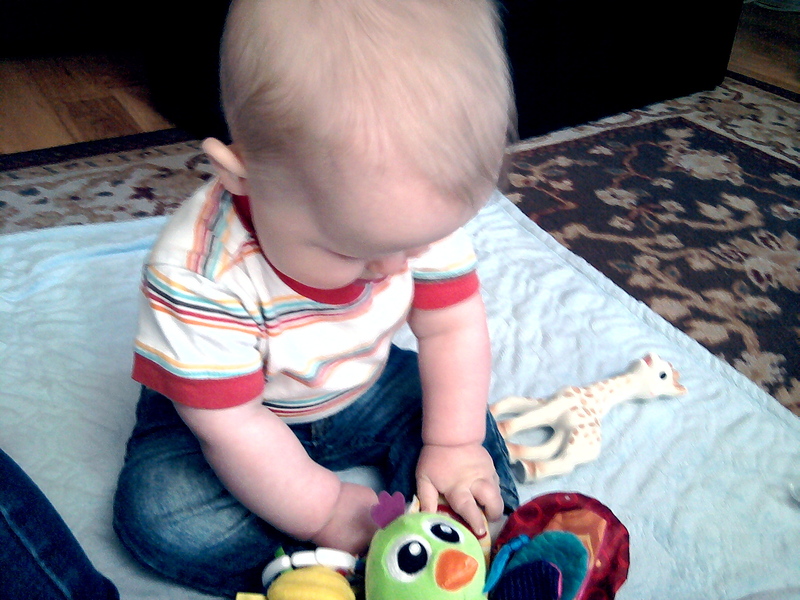 He grunts as he giggles and ferociously attacks his toys. He's so much more alert, interacts in such a personal way, and is definitely getting a personality. This weekend held a lot of "firsts" and I'd love to share them with you. My husband helped Nicholas hold the pen and "sign" his name. I cried when I opened the envelope. 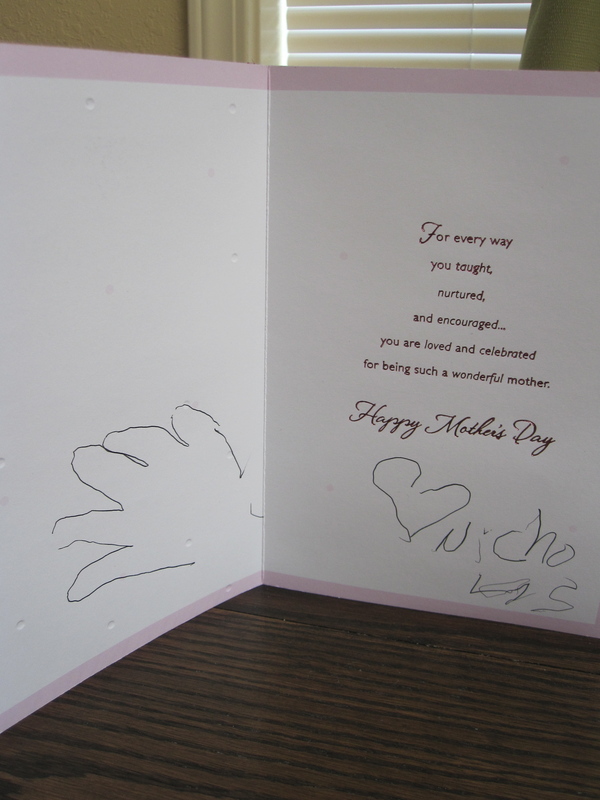 Even though I obviously know that Nicholas didn't sign his own name, it was a very sweet gesture by my husband! My first Mother's Day gift - a new chef's knife! 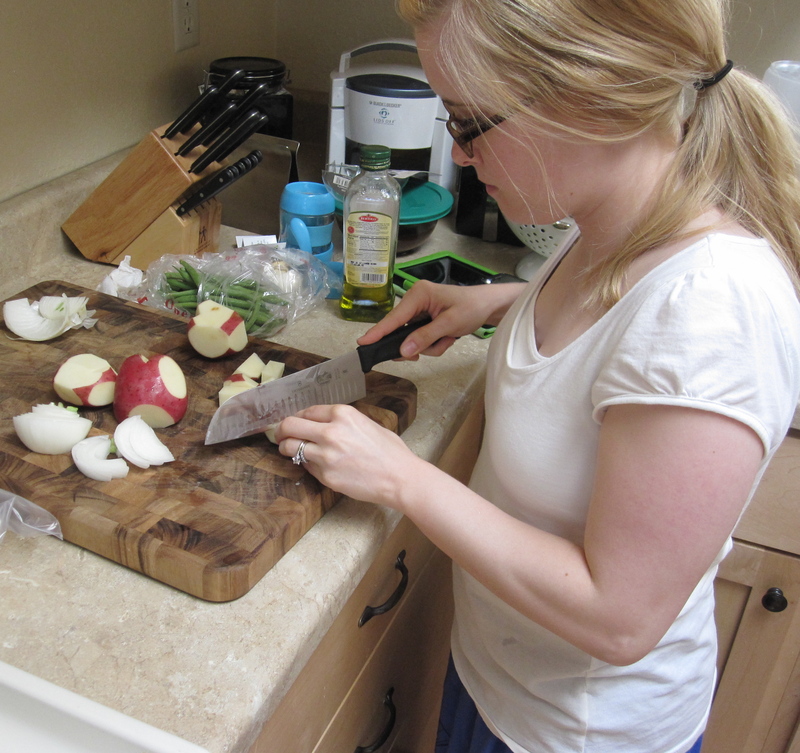 I made dinner on Sunday and this knife literally cut my chopping time in half! (yes, pun intended.) Here's the maiden voyage of my new knife! This weekend Nicholas rolled over and sat up on his own for the first time! He here is demonstrating his buff ab muscles. And his incredibly fuzzy hair...unfortunately he gets that from me. 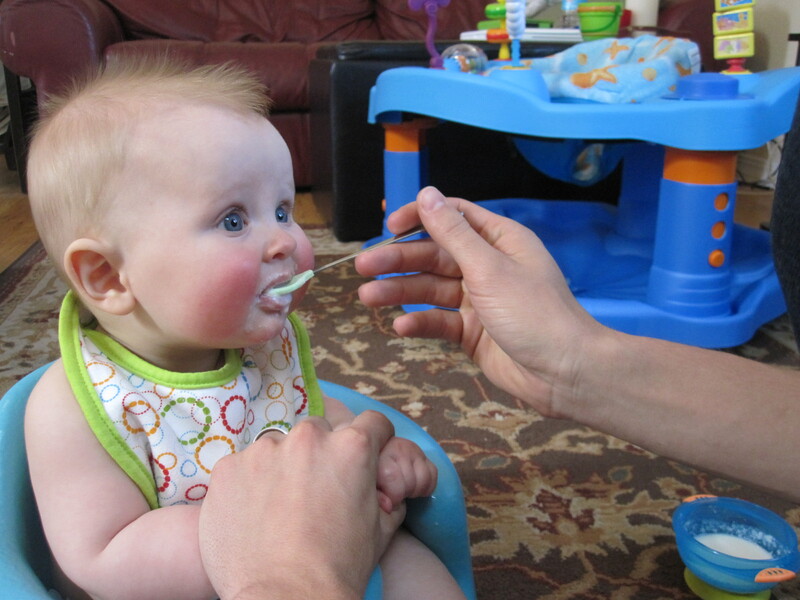 We also gave him his first solid food. So far he doesn't think much of brown rice cereal, but I was very entertained. 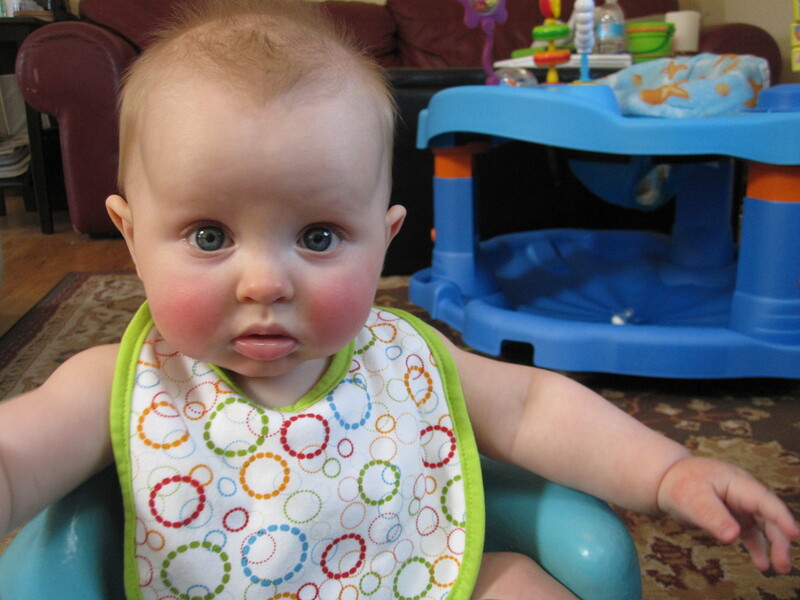 A combination of teething and warm weather make for his adorably rosy cheeks. These milestones, as little as they might be, have been so fun to celebrate. It truly amazes me to watch this little person grow before my very eyes! He's changing so quickly and I know that someday I'll forget what his little laugh sounds like, or just how far he can stick out his lower lip when he's pouting. Today I want to savor each moment, because tomorrow there'll be something else to celebrate! 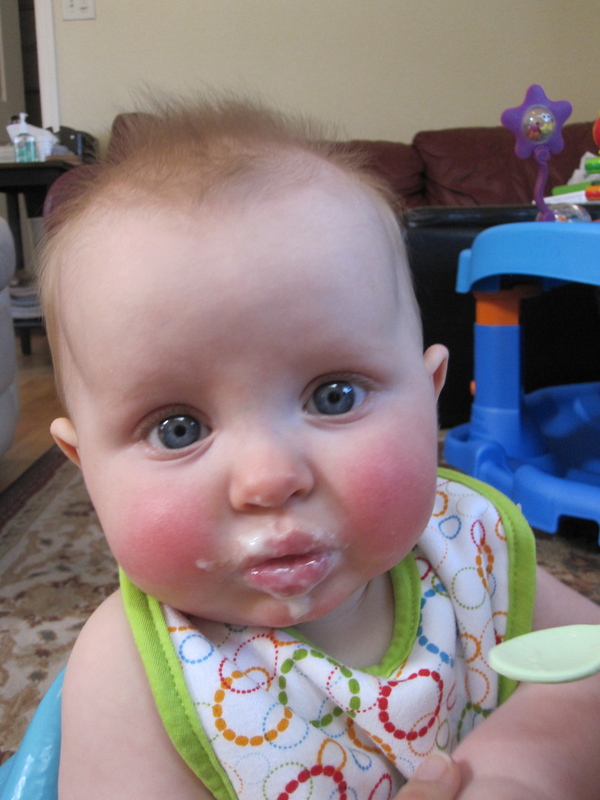 Awww, feeding times are so cute when they're infants like this : ) I miss my son's babyhood days. He's now 20 months old and his baby-ness is vanishing every day. It's wonderful that yo really take your time to enjoy your family's milestones. You are so blessed to be able to witness every little thing about them as a stay at home mom. I miss those sweet newborn snuggles too...but I love seeing my little one learn new things each and everyday! Glad you had a wonderful first mother's day! being a mommy is truly the best! Lovely :) He's such a cutie!